Amazon Price: $179.00 $59.00 You save: $120.00 (67%). (as of October 18, 2017 7:59 am - Details). Product prices and availability are accurate as of the date/time indicated and are subject to change. Any price and availability information displayed on the Amazon site at the time of purchase will apply to the purchase of this product. 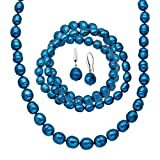 Make a statement in this indigo ringed cultured pearl ensemble. Necklace features a graduating design and bracelets feature a stretch design for complete comfort. The balls of the earrings hang on "thin at top, thick at bottom" style hook for a metal-heavy look. Earrings measure 1 1/4 by 5/16 inches and feature fish hook back-findings. Bracelets measure 7 1/4 inches in circumference. Necklace measures 20 inches in length, finished with a lobster claw clasp. Pearls have been dyed to enhance their appearance.